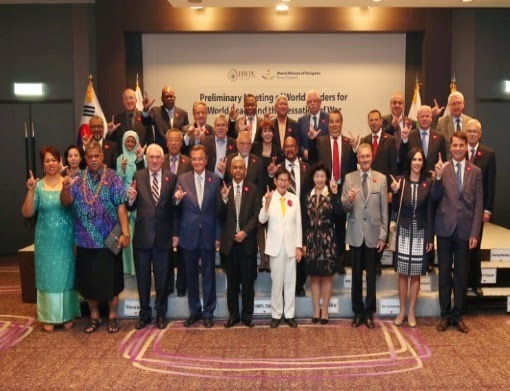 The World Alliance of Religions’ Peace Summit (“WARP Summit”), began on September 17th 2014, in South Korea under the auspices of the Heavenly Culture, World Peace, Restoration of Light (“HWPL”), and its two subsidiary organisations, the International Women’s Peace Group (“IWPG”), and the International Peace Youth Group (“IPYG”). The summit is being organised in the hopes of creating a platform for dialogue between community leaders on national, cultural, spiritual, and ethnic levels. Such dialogue will pave the way to the creation of a universally applicable value system, reflected and implemented across all perceived social boundaries through an international law designed to eliminate war-activity from our world. In order to achieve this goal, the summit will have two focal points. First will be the discussion and signing of an agreement for cooperation between leaders of essentially secular communities (countries, cultural, and ethnic groups). Secondly, discussion with religious leaders regarding the ways in which to align the fundamental value systems of each represented religious teaching such that its doctrines might no longer be used to promote violent behavior. This unified system of values, applicable to all religious systems, is what HWPL refers to as the World Alliance of Religions, or the unification of religion. Over the course of the past two years, HWPL has been actively engaging prominent leaders of both secular and religious communities around the world in discussions pertaining to their role in the achievement of world peace. This summit is the natural result of such meetings and a time in which each person with whom HWPL has met, is invited to share his or her insight into the best course of action for us as the family of humanity to take in order to secure a peaceful and prosperous future for the generations to come. On 17th of September, participants of WARP peace summit were treated to spectacular speeches from important figures such as Emil Constantinescu (Former President of Romania), Stjepan Mesic (Former President of Croatia), Marisol Espinoza (Vice President of Peru), Gaudencio Borbon Rosales (Cardinal of Archdiocese of Manila). If we can abolish the International law that allows for the declaration of war, then in reality peace can arise. This is an amazing method to achieve peace! Thinking of a strategy that no other peacemaker has thought of such a thing, we support Man Hee Lee peace leader of HWPL.